*This post may contain some affiliate links for your convenience (which means if you make a purchase after clicking a link I may earn a small commission, but it won’t cost you a penny more)! Click here to read my full disclosure policy. How far along? 26 weeks. 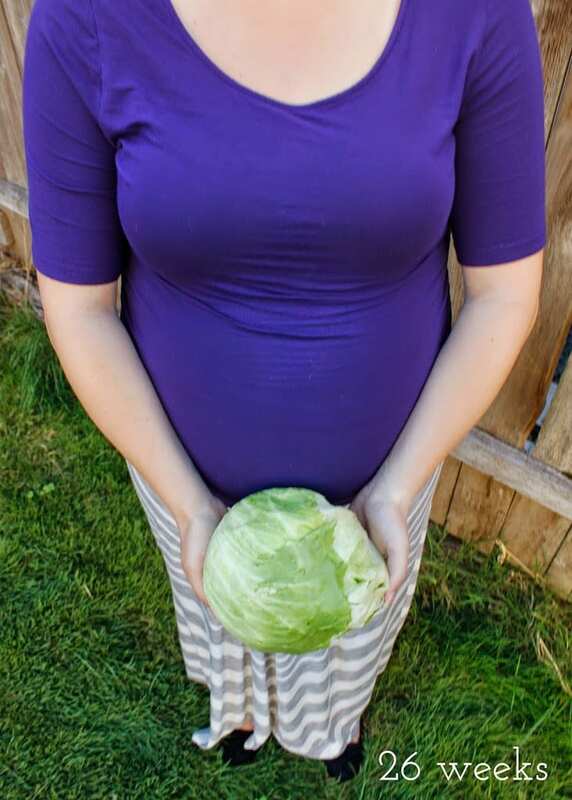 Depending on the app, baby girl is either the size of a head of lettuce, eggplant, or the length of a green onion. Hmmmm. I went with the lettuce. 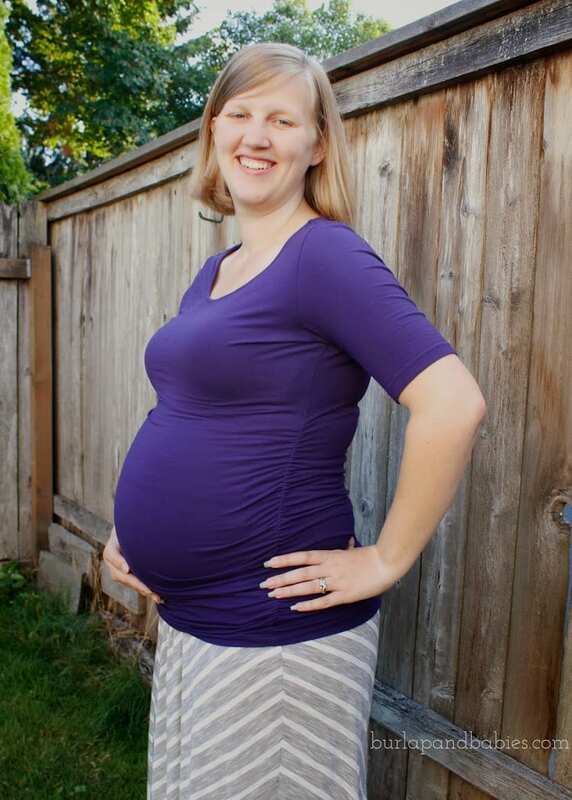 Maternity clothes: Absolutely! Bought this purple shirt I’m wearing in the picture from Goodwill for $4.99!! And the skirt is one of only two maternity clothes I’ve bought full price so far, well it was buy 1 get half off but best purchase ever. So comfy!! Sleep: Doing good. Waking up about once a night to go to the bathroom. I even survived tent camping this past weekend without it being a big issue. Food cravings: None still. I’m starting to think I’m going to be one of those prego ladies who doesn’t have cravings. I feel like I’m missing out!! Symptoms: Edema on and off but mainly in the evenings when I’ve been on my feet a lot. I am one of the lovely 75% of pregnant ladies blessed with that dark line up your belly, linea nigra. And it’s just getting darker as the days pass on. Total weight gain: Ashamed to admit it but it’s the truth. I have gained 21 pounds since getting pregnant. However, I do feel good that I haven’t gained anything in five days now. Eating a lot more protein and walking more certainly helps. I am determined to be healthy for this dear little one I’m growing. Movement: All the time! This little girl is just like her momma and doesn’t like to be woken up. When she does, she gets angry! Her active time is in the evening after dinner time. Gender: Still a girl! If you missed our gender reveal post, you can read all about it HERE. Labor Signs: Been getting Braxton-Hicks every few days still. Belly button in or out? In but definitely getting less deep. Wedding ring on or off? On, my fingers only seem to get swollen when I go on long walks. Best moment this week: Glider came this weekend and makes the empty room start to look like a nursery! Looking forward to: Conquering our half marathon on Saturday!! Wish me luck! Hi! I'm Amanda, wife to my high school sweetheart, and momma to two precious girls. When I'm not busy playing with my babies you can often find me covered in sawdust in my garage or hiding in a coffee shop drinking a hazelnut latte. Thanks for stopping by and I hope you'll find inspiration to create, decorate, and celebrate. I love these little bump dates with different food items. Such an awesome idea!